Working class needs real political opposition to Con-Dem millionaires! Over the last week the Socialist Party and others have been hysterically attacked in the right-wing capitalist press for opposing slave labour workfare schemes. But this opposition is vital and TUSC is also at the forefront of opposition to these 'work for your dole' schemes. In the last year 83,000 retail workers have lost their jobs, the biggest increase in unemployment in any sector. The government's 'solution' is to force the unemployed to work for free for the major high-street retailers, most of whom are still making mega-profits. Overwhelming public opposition to workfare has forced company after company to distance itself from the government's scheme. In the houses of parliament however, the silence has been deafening. The so-called 'opposition', New Labour, is silent for a reason; it introduced most of the elements of workfare when it was in power. It was Labour that first contracted out large parts of workfare to the private contractor A4e, whose former chair, Emma Harrison, gave herself £8.6 million last year alone. It wasn't quite 'all 4 emma' though, as the Labour ex-home secretary, David Blunkett, also gets £30,000 a year as a 'consultant'. When Youth Fight for Jobs national organiser Paul Callanan appeared on BBC's Newsnight it gave a taste of what public debate would look like if there was a real opposition. Instead of Labour's silence Paul explained how workfare exploits the unemployed in the interest of profit and gave a taste of a programme that could create socially useful jobs. It is not only on workfare that Labour policies are virtually indistinguishable from those of the Con-Dem government. Both Ed Balls and Ed Miliband have stated clearly that they support the public sector pay freeze and that a Labour government would not reverse any of the Con-Dem cuts in public spending. Those cuts, less than 10% of which have so far been implemented, would mean misery on a Greek scale for workers in Britain. The health service, pensions, benefits, social services and education are all facing destruction over the coming years. At local level Labour councils are all implementing government cuts; at national level Labour is saying it would do nothing to reverse the devastation being wreaked by the Con-Dems. The Tory party is a party of big business, of the 1%, with a cabinet of millionaires, funded to the hilt by the City of London. Working class people desperately need a mass party that stands up in the interests of their class. New Labour is not such a party, on the contrary, it is today another capitalist party, with policies driven by the desire to please the markets rather than meet the needs of the population. This is becoming clear to increasing numbers of workers. This year at the conferences of those unions that are still affiliated to the Labour Party there will be unprecedented pressure to discuss why members money is being used to fund a party that is attacking their pay, pensions and public services. At the GMB conference, for example, an unprecedented 25% of resolutions submitted are questioning the link with Labour. It's no surprise that the Socialist Party and others call on the affiliated trade unions to break the link with Labour. However, non-political trade unionism is not the answer. In 2011 workers showed their industrial might, above all with the magnificent two million-strong public sector strike on 30 November. But the trade union movement also needs a political voice, otherwise we are fighting with one hand tied behind our backs. 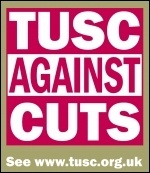 The Trade Unionists and Socialist Coalition (TUSC), which brings together socialists and trade unionists to stand anti-cuts candidates in elections is a step in the direction of such a party. The list TUSC is putting forward in the London Assembly elections is an important step forward. It is headed by Alex Gordon, President of the RMT, and also includes prominent trade unionists from FBU, PCS, CWU, POA and others. In addition TUSC is encouraging trade unionists and anti-cuts campaigners to stand in as many local authority seats as possible.